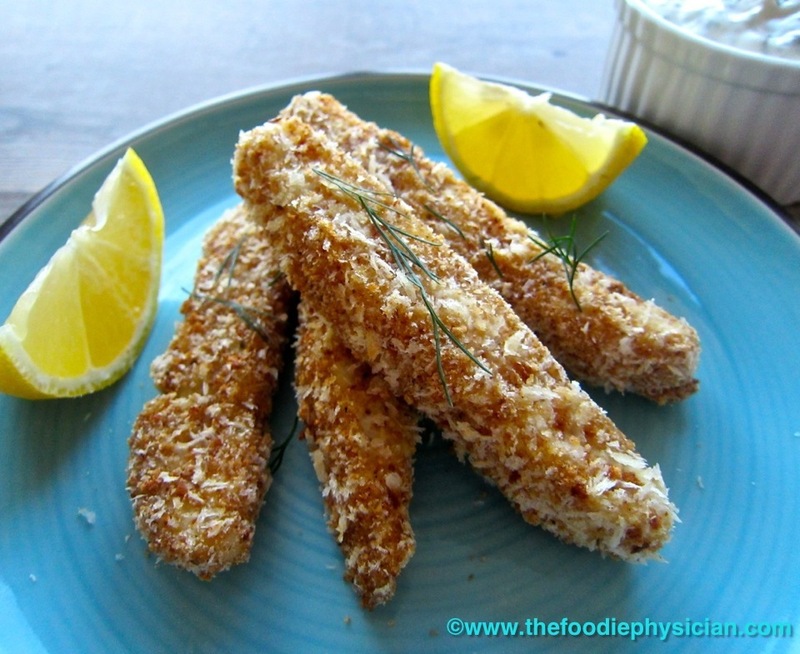 Frozen fish sticks are a staple in many households. And for a lot of families, they are the only type of seafood that kids will eat. Unfortunately, they’re not the healthiest option as they’re usually coated in a thick batter and fried prior to freezing. Also most frozen fish sticks are highly processed without much nutritional value. In addition, they’re usually high in calories, saturated fat, and sodium. 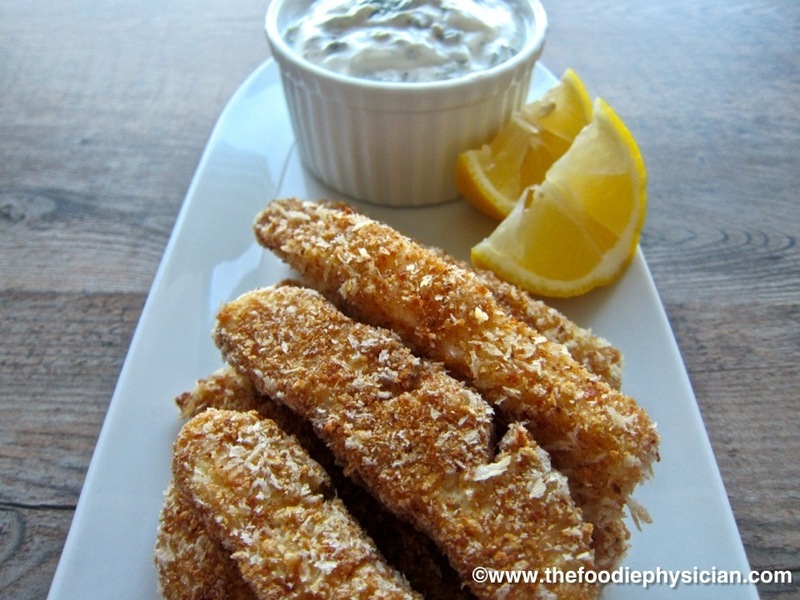 To top it all off, fish sticks are usually served with tartar sauce, a mayonnaise-based sauce that’s also high in calories and saturated fat. More fish, less breading. 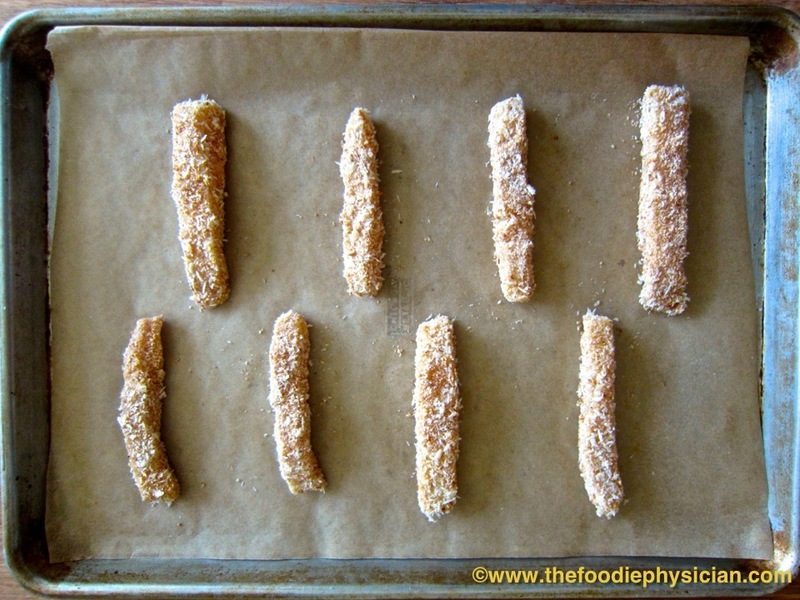 Most frozen fish sticks have a small amount of fish and a large amount of breading. In my version, the fish is the star. I use wild Alaskan halibut. It’s a great choice for this dish because it has a firm texture that stands up to breading and a nice mild flavor that the whole family will like. Alaska’s seafood is eco-friendly and its fisheries are managed for sustainability. In addition, its marine habitats are also nearly pollution-free. Halibut is a lean fish that’s packed with protein and several nutrients. And unlike the types of fish usually found in frozen fish sticks (cod or pollock), Alaskan halibut is rich in omega-3 fatty acids, which have numerous health benefits. Oven baked rather than fried. To give the fish sticks a nice golden color and crispy crust, I spray them with olive oil before putting them in the oven. I used a cooking spray made with olive oil but you can also use a misto oil sprayer. They are both great options for low fat cooking because the amount of oil that comes out in a spray does not add a significant amount of fat to a recipe. crispy texture of the panko but with all of the health benefits of whole grains. which is made with mayonnaise. My sauce uses mostly nonfat Greek yogurt, which is fat free and naturally creamy. It’s mixed with just a small amount of light mayonnaise and Dijon mustard for flavor. Briny capers, fresh dill and lemon infuse the sauce with bright, fresh flavors that nicely complement the fish. To make the Lemon Caper Dill Sauce, mix the yogurt, mayonnaise, mustard, lemon juice, zest, dill and capers together in a bowl. Season the mixture with salt and pepper. Refrigerate until ready to eat. To make the fish sticks, first set up a breading station. 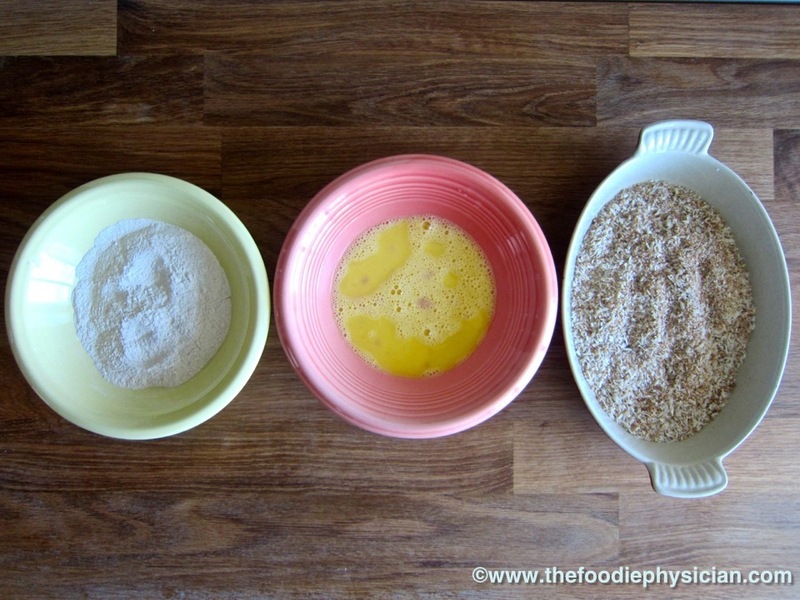 Place the flour in a dish and mix in ¼ teaspoon salt and 1/8 teaspoon pepper. Whisk the egg with 1 tablespoon water in a bowl. Mix the panko and whole wheat breadcrumbs in another dish with the Old Bay, ¼ teaspoon salt and 1/8 teaspoon pepper. Working with a few pieces of fish at a time, toss the fish in the flour to coat them well. Then dip the fish in the egg mixture. Let the excess liquid drip off and then place the fish into the breadcrumbs. Turn them around in the breadcrumbs until they are fully coated. Place the fish on two baking trays lined with parchment paper or aluminum foil. 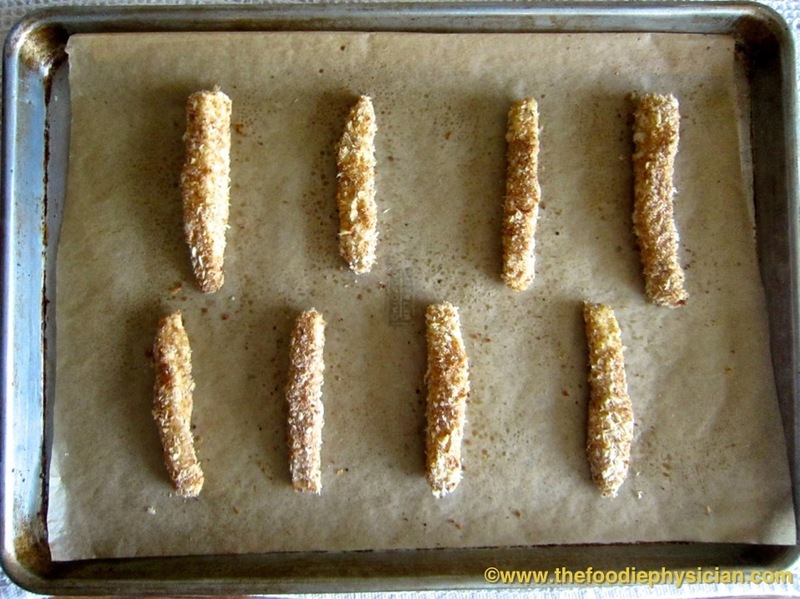 Spray the fish sticks lightly with olive oil spray and place the trays in the oven. Bake 12-15 minutes until golden brown. 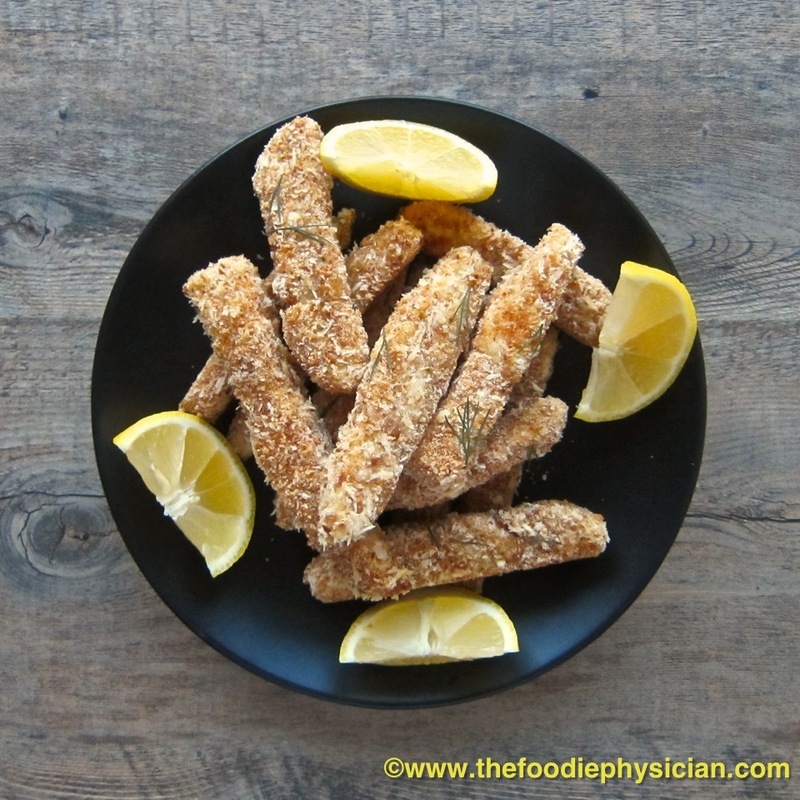 Serve the fish sticks with Lemon Caper Dill Sauce. Serve lemon wedges on the side. Nutritional information reflects the amount of flour, egg and breadcrumbs that adhered to the fish- the rest was discarded. Your site is unique and exciting and I am glad to find it. However,I really loved golden brown fish sticks. I will definitely try out. Would coconut flour or almond flour work also? Wanna try this, I love to eat fish a lot. Thanks for the recipe, my husband will like this. My grand daughter loves fish sticks. I am going to make this version and bake it instead of frying.